the score victory = if no other victories are met by a certain number of turns, the civ with the highest score wins. Earlier games had fewer victories (only military and space race), but there have been other victory types as well. Civ III and IV had a victory that simply required the player to occupy a majority of the map's land area and population (which could be achieved via military conquest and/or relatively peaceful expansion). I liked this victory type because it facilitated role-play by allowing me to grow my empire organically without having to feel like I was constantly meta-gaming for one of the other victories - just keep growing by whatever means are necessary or convenient. 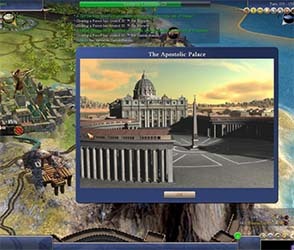 Civ IV also had a religious victory that required you to convert other players to your religion and then get them to elect you to be Pope or whatever. Civ: Revolution and the board game even included an economic victory in which you must accumulate a certain amount of wealth tokens. This was different than the "economic victory" of Civ V, in which you save up enough money to buy out the alliance of every city state on the turn before a U.N. election. Civilization IV included a religious victory [LEFT], and the board game includes an economic victory [RIGHT]. 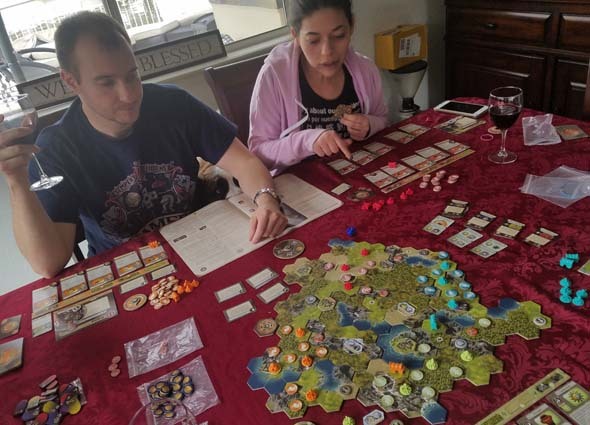 I’m a big fan of the new Civilization board game (as well as the computer game). I stated in my review that if an expansion ever came out, that I would pick it up immediately. Well, last fall, Fantasy Flight Games released Fame and Fortune, and I didn’t waste any time picking it up. Unfortunately, we have a lot of board games that we play, so I’ve only gotten to have a handful of Civ games with the expansion. This is one of the reasons that I’ve waited so long to write a review; I was hoping to get a few more games under my belt before settling on a final opinioin. 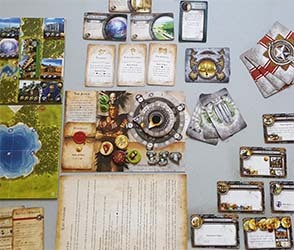 But since I recently reviewed the Gods & Kings expansion for the PC game, I thought I'd go ahead and throw my opinions on the board game expansion out there too. Great People have great power! Investing in your empire weakens your "economy"
The new civs are fun, but watch out for those Greeks and Spaniards! More players = more fun? Investing your gold coins provides permanent bonuses, but subtracts them from the coins you have available for the Economic Victory. As a fan of the Sid Meier’s Civilization video game series (particularly, Civilization IV - which I argued on Geek Fights is the best video game ever made! ), I was skeptical - but also excited - at the prospect of a Civilization board game based on my beloved game franchise. Could the feeling of building a civilization to stand the test of time and the one-more-turn addictiveness of the video game be replicated in a board game without the game itself becoming too long and boring? Well, put simply, it can! And Sid Meier’s Civilization: the Board Game is proof!